Omied has impeccable comic timing and a sharp witted sense of humor that is very in-tune with the genius of Grouhco. This shoot was great fun and Omied had us laughing out loud. Ha ha, this is hilarious. 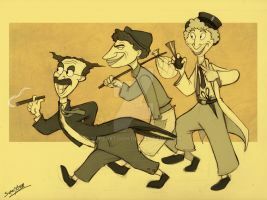 Really captures the spirit of Groucho and the Marx Brothers movies. This one is brilliant! great!